Mmmmmm ice cream! 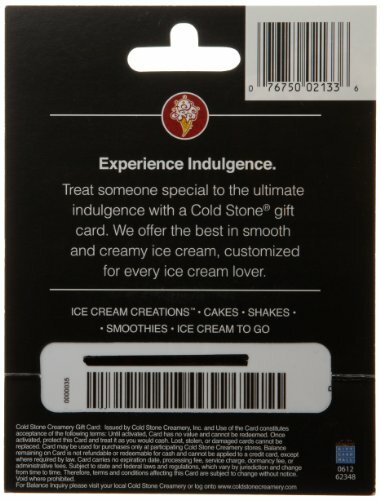 Cold Stone Creamery offers the best in smooth and creamy ice cream, and it is personalized for every ice cream lover. The top secret recipe for smooth and creamy ice cream is handcrafted fresh in each store, and then personalized by combining a variety of additional ingredients directly on the frozen granite stone. 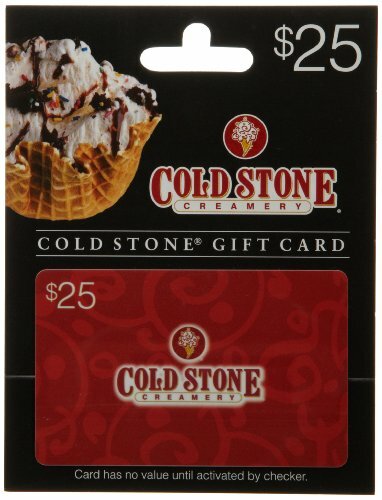 Cold Stone Creamery operates nearly 1,400 locations so you’ll find plenty of places to use your gift card. This giftcard works as a great year round gift for friends, family, coworkers, and even as a reward for yourself – you deserve it! Cold Stone Creamery offers the best in smooth and creamy ice cream, customized for every ice cream lover. Cold Stone Creamery operates nearly 1,400 locations.